Indoor allergens range from the obnoxious like pet dander, pollen and dust to the downright dangerous like mold, smoke and dust mites. Long term respiratory or allergic issues when inside your Columbus house are usually a clear sign of an indoor allergen problem – usually something you can fix. Step one is to identify the source of the discomfort. Most allergens are related to something you have in or around your home. For example, if you have a cat or dog, you very likely have high levels of pet dander. A flower garden outside or lots of plants inside can result in high pollen levels. Excess moisture in your basement or attic can result in dust mite and mold growth. If you are unsure of what allergens are causing your discomfort, there are companies that can test the air in your home for specific allergens. These tests look for all allergens as well as potentially dangerous contaminants like radon and MVOC toxins from mold and mildew. Once you know for sure what your problem is, it’s time to cut back on the allergens. Mechanical fixes are available in the form of air filters and advanced ventilation systems. You can supplement those solutions by implementing a series of simple upgrades to your insulation to keep out the pollutants that are outside. The key is to make sure the air flows freely through your home and filters remove and ventilate the air properly to keep it from growing too stale and making you sick. You can also cut back on the use of certain chemicals and materials that cause allergens to build up. For example, aerosols, paints and glues produce a number of irritating gases that tend to stick around inside. Additionally, make sure your pets are cleaned often and that your upholstery and carpet is vacuumed daily by a HEPA quality vacuum cleaner. This will severely reduce the presence of dust, dust mites and dander. By focusing heavily on the reduction of pollutants and allergens like dander, pollen and dust, most of your Columbus indoor air quality problems will be solved. 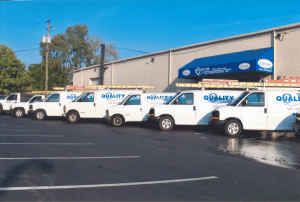 Call Quality Air Heating and Air Conditioning today to learn more!